The quaint and picturesque country town of Stratford-Upon-Avon (which, as its name suggests, rests on the banks of the River Avon) is the historic birthplace of William Shakespeare. 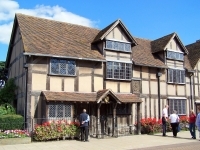 Visitors can explore Shakespeare's birthplace, Mary Arden's House (where his mother lived before marrying his father), his wife Anne Hathaway's cottage, as well as the school Shakespeare attended. Stratford-Upon-Avon is within easy access of the Cotswolds, set in the beautiful, rural Warwickshire countryside. A vintage train service, the 'Shakespeare Express', offers a fun way to access Stratford-Upon-Avon from Birmingham or Henley. Even those who are not much interested in the biographical details of the Bard will find Stratford-Upon-Avon charming.